Common and annoying, blackheads occur when your pores become clogged with excess sebum (an oil created by the sebaceous glands that keeps skin supple) and dead skin cells. The difference between a black head and a white head is simply whether or not the pore is open or closed. If the pore is open, the plug of sebum/skin cells oxidizes as it is in contact with the oxygen in the air, which turns it black. Blackheads are not caused by dirt. Let’s make that clear from the beginning. Scrubbing your face obsessively is not a good way to get rid of your blackheads, and is only going to make it worse as you’ll just end up drying out your skin, which will cause more oil to be created to make up for everything you stripped away, and…well it’s a vicious cycle. For this reason, don’t use some of these remedies more than 2-3 times a week, such as the sugar scrub and pore strips. I know it can be hard to resist, but your skin will be better off this way. Bentonite clay is a mineral rich healing substance that has been used for centuries to treat a number of ailments, chiefly skin related. Because of its molecules “electrical charge” when wet, it does an amazing job of drawing out oils or other impurities locked in your pores. When you apply the mask your skin gets to drink in all the minerals, while the clay simultaneously draws out the blackhead. It also helps with circulation, which helps with overall skin tone and health. You can mix the clay with water or apple cider vinegar, maybe sticking to the former if you have dry or sensitive skin. Experiment! This mask will make you feel like your face is tightening as it dries. Whether or not you let it dry entirely is up to your preference – I tend to let it dry most of the way and then just moisturize afterwards, but other people find that dries their skin out and irritates them. Egg whites form an easy mask that can be used to temporarily tighten pores, thus reducing chances of future blackheads, and will also remove current blackheads. Egg whites are also rich in nutrients for your skin, and are a little less drying than some other home remedies for blackheads. When the mask is dry, your face may feel tight – this is supposed to happen. Peel the tissue off, and then gently wash your face to remove any residue. Pat dry and moisturize as usual. Alternatively, you can leave out the tissue and simply apply 3-5 layers of egg white, being sure to let each layer dry in between applications. If you do not let the layers dry, this will not work! Mix 1 tablespoon of organic raw honey with 1 teaspoon of milk. Heat it for 5-10 seconds in the microwave, and then mix again to blend thoroughly. When it’s a comfortable temperature, apply a thin layer over blackheads, and then gently but firmly pat a strip of dry, clean, cotton onto it. Let dry (to play it safe, wait at least 20 minutes) and carefully peel the strip away. Rinse with cold water and moisturize as usual. It sounds like a delicious candy, but cinnamon and honey make a wonderful combination for getting rid of blackheads. Again, the anti-bacterial agents in the honey can help keep away bacteria that are causing acne (not necessarily blackheads, but still a bonus) as well as act as the adhesive to pull out anything clogging your pores. Cinnamon improves circulation, and this increased blood flow gives your skin a smooth, healthy, glow. Mix the honey and the cinnamon together until you have enough paste to cover the affected area. Apply in a thin layer over the blackheads and then press a strip of clean cotton over it. Let it sit for 3-5 minutes before removing and rinsing your face. Don’t forget to follow up with a moisturizer! While pore strips and face masks work wonders, they can only be used several times a week to avoid drying your skin out to much. If you want to do something daily to prevent your blackheads, a gentle rinsing with water 1-2 times a day is the way to go. This keeps things that can make your pores appear larger-such as excess sebum and dead skin-flushed away and your pores clear. Be sure to use a light moisturizer when you are done to prevent your skin from trying to produce excess sebum to accommodate for dryness. Twice a day splash your face with clean, fresh water. Pat dry with a soft towel and apply moisturizer as usual. I suggest doing this early afternoon (so you wash away anything that has built up in the first part of the day) and evening, but morning and evening works as well. Since blackheads are caused by open, clogged pores reacting to oxygen, it only makes sense that “shrinking” your pores down will help. Lemon juice is just the astringent substance needed to get the job done, however, it can lighten skin temporarily and it does make you sensitive to the sun, so load up on sunscreen if you plan on using this method in the summertime. If you have sensitive skin, try diluting the lemon juice with water first. Rinse your face and pat dry. Squeeze the lemon juice into a small bottle and then use just enough to dampen a cotton ball. Apply to affected areas 3-4 times a week, at bedtime. When you wake up, rinse your face with lukewarm water and apply moisturizer as usual. Store the rest of the juice in the refrigerator for up to a week. Be aware-the juice can sting sometimes! Although sweat glands and hair follicle pores aren’t the same thing, sweating can still help minimize blackheads. When you work up enough of a sweat, the liquid naturally flows over and softens/flushes anything clogging your pores. It is absolutely vital, however, that you wash your face immediately before and immediately afterwards, otherwise the affect can be detrimental. If you leave on make up or anything before this the sweat can carry it into your pores, and if you don’t wash afterwards not only is all that stuff still in there but now there’s dried sweat blocking up your pores as well. So on one hand sweat can cleanse pores, on the other; it could also clog them. Be sure to do it right from the start! A little baking soda goes a long way for blackheads, but don’t overdo it, as it can seriously dry out your skin thanks to its saltiness. Mix water with enough baking soda to form a thick, but spreadable, paste. Using a gentle circular motion, massage the paste into your skin. Rinse thoroughly with plain water, pat your face dry, and then make sure you moisturize. Sometimes all you need is a good exfoliating followed up by moisturizing. Exfoliating does one very important job-it sloughs away dead skin cells. These are the skin cells that could potentially clog up your pores, leading to acne, whiteheads, and of course, blackheads. Exfoliating also temporarily revives circulation and it leaves you with a healthy glow and soft skin. If possible use jojoba oil, as it is the oil (technically liquid wax) that most closely mimics our skins own sebum! Mix 4 tablespoons of oil into 1 cup of sugar, stirring until everything is fully incorporated. Add several drops of essential oil for fragrance if you like. Stir before using and then wet face, scoop some scrub onto your fingertips, and massage it over your skin in circular motions. Rinse with water and moisturize as usual. Do this no more than 2-3 times a week, otherwise you risk drying out and/or irritating your skin. Steam may not literally open your pores (see blackhead myths below) but it can help reduce the appearance of them by softening up trapped sebum/dead skin cells that can fill out your pores and form blackheads. Be careful not to get to close or you risk burning your skin. When you are done, rinse your face with warm water and pat firmly but gently dry with a clean towel (or gently wipe away the blackheads.) Moisturize as usual. Repeat this several times a week, or as needed. Skin care is a balancing act – keep that in mind whenever you’re doing something that involves cleansing or washing (or pore strips.) Overdoing it is going to make matter much worse in the long run. Pore strips are great when you really need them, but it’s best to try and prevent the blackheads in the first place by keeping up a good skin care regime. Make your own toner by mixing together ACV and crushed mint leaves. The apple cider vinegar can help breakdown the stuff causing the blackhead, while the mint creates a cooling “tightening” sensation on your skin. If the area around the blackhead is swollen or irritated (e.g. you were picking at it even though you shouldn’t be) the menthol can help tame the inflammation. Inflammation can make it harder for whatever is clogging your pores to come loose in the first place. Combine vinegar and mint in a small bottle and let it sit for 1 week in cool dark place. Strain, add a cup of water, and store in the refrigerator for up to 6 days. Use nightly, rinsing your face first with water and then using clean cotton balls to apply the toner. Leave on overnight or up to several hours (if you have sensitive skin) and rinse off in the morning. Follow up with a moisturizer. Like acne and so many other skin conditions, myths abound about how to get rid of blackheads. Below are the 2 most common. Blackheads Are Caused By Dirt: Just in case you missed this part in the intro, blackheads are not caused by dirt. If you have larger pores, the dead skin/sebum build-up reacts with oxygen turning the substance black. Voila-a blackhead! A whitehead occurs when the pores’ opening is smaller and the sebum plug does not react to the oxygen. You Can Shrink Your Pores: Nope, not possible. Pores are not muscles, therefore they cannot open or close. They are simply holes that house the hair follicles and sebaceous glands that are covering your body. Some things, however, can make pores appear smaller-such as lemon juice, which is an astringent and causes contraction of skin tissue. Otherwise, keeping them clear from blockages that can stretch them wider is the way to go. What is a pore strip? Some of these remedies are homemade versions of pore strips, but here is a brief explanation so you can experiment with making some on your own. When you pull the strip off, you pull the plug of sebum and dead skin cells out of the pore, and voila! The blackheads are gone. Keep in mind this does not prevent blackheads – only gets rid of them after they have popped up. The nice thing about making them at home is they save a decent amount of money, and you don’t have to worry about commercial adhesives on your face. 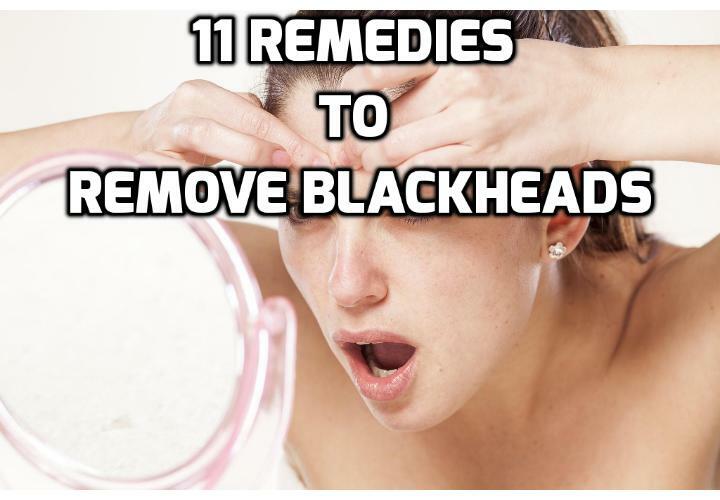 You can also watch this Video HERE to learn about other remedies to get rid of blackheads.